Special April pricing offered below. Chest putters have been all the rage. They putt straighter. They overcome the yips. They eliminate scuffing the ground. They lower scores. With the top of the shaft pinned against your chest, the resulting pendulum motion is straight back and through resulting in more consistent scoring. As you probably know , after many years of success, they became the focus of controversy and finally a USGA and R&A ruling that you can no longer anchor the shaft against your body. To be clear, that only applies to official governed tournaments. Most casual tournaments such as fund-raising events do not enforce the USGA and R&A Rules. So many golfers will continue to use and anchor long chest putters because the majority of players are not concerned with the official tournament Rules. However, if you play by the Rules of Golf and want to use a chest putter, your top hand can no longer be anchored to your chest. Many golfers are adapting without anchoring their top hand as Bernard Langer has done so successfully on the Senior Tour. The death of the long putter? Not so fast! The golf industry experts predicted that long chest putter would cease to exist when the USGA stopped allowing anchoring the club. 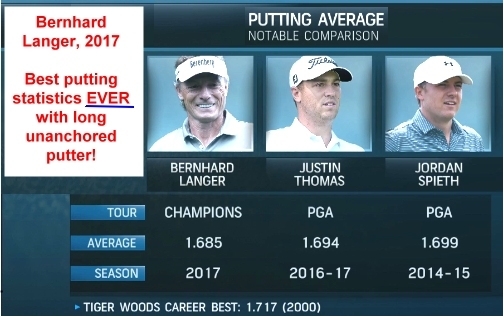 One year later, on October 30, 2017, The Golf Channel’s Brandel Chamblee acknowledge that the long putter wasn’t dead yet. He included stats that the two players on the Champion’s Tour using long putters are numbers 1 and 2 in fewest putting strokes. But more than that, Bernhard Langer is putting better than anyone ever has…including Tiger Woods in his best year, Jordan Speith in his best year, and Justin Thomas in 2017, his best year. And ho hum, Langer is DOMINATING the Champions Tour again. Click here to watch the Golf Channel segment about Bernhard Langer and the long chest putter. This link will open in a separate browser window so you won't lose your place on this page. So we don’t have to give up our long putters. We just have to learn to putt without anchoring the top hand like Langer does. It still has the advantage of a smooth, steady stroke, no wrists, a heavy head, better alignment sight lines, and it overcomes shaky nerves that seem to increase with age. The following video is a great explanation of the advantages of using long putters without anchoring them. While many companies are no longer making long putters, we still have many loyal customers who use and promote our telescopic chest putters. We will continue to build long putters as long as our customers want them. With the square shape and straight sight-lines of our Pole-Kat heads, it is very easy to see that the head is lined up with the putting line, and it stays aligned in the back-swing too. Long putters are also referred to as "Chest Putters" and "Broomstick Putters". With all the popularity of long putters, the big-name manufacturers haven't been able to solve a big disadvantage: They are difficult to travel with because they don't fit into a travel golf bag. We have a solution for that! With a telescopic shaft, there is no need to avoid a chest putter or to sacrifice the ideal length because you can't fit it into your travel bag. We have solved that problem with the same proprietary telescopic shaft technology we use for our other telescopic clubs. Our shafts are rock-solid when extended. In fact, on robot testing with our full-swing clubs, they perform the same as one-piece shafts. Even though putting is less stressful on the shaft, it is critical that there be absolutely no movement in the shaft to produce perfect straight putts. Our shafts meet that demand. Just to let you know that I just received your 50 inch Pole Kat chest putter...safely delivered here in the United Kingdom. I currently use a Rife 50 inch chest putter which I always had to leave behind when traveling. I am absolutely delighted with my new chest putter. The look, the feel are great. I no longer have to worry about using a short putter on my travels. Thanks for your excellent putter and great customer service. It is much appreciated. Shaft Locking Technique: Our standard telescopic shafts are NOT screw-in sections or lever-tightened parts that wobble during the putting motion like some so-called "travel putters". Our telescopic shafts interlock based on what is called a "perfect machinist's taper". We machine the inner and outer surfaces of the shaft so they lock on each other and the two sections become one. The shaft CANNOT be loosened until the collapsing cap on the grip-end is smacked onto concrete. Our proprietary stainless-steel collapsing cap extends through the end of the grip. When it is driven down into concrete, it transfers the impact into the shaft sections and dislodges the machinist's taper lock. It is very simple to extend and collapse the shaft. You can see how they extend and collapse here. NOTE: Our telescopic shafts are not "adjustable length." They are either collapsed for travel, or extended to their full length for play. We will fit your putter to your height and stance. There is more information about lengths and how you can determine what length is best for you at the bottom of this page. These Pole-Kat heads are specifically designed for Chest Putters. Because of the additional length with your hands separated, require heavier heads. At 475 grams compared to conventional putter heads which are 325 to 350 grams, the Pole Kat has a great feel. With the extra weight and straight back and through pendulum stroke, your putts will be more solid and true. They offer great balance, superb feel, and ultra-high MOI. The square shape and sight lines make it easy to align them, and to stay on line during the pendulum swing. Left Handed? Click here to see the head description for lefties. If you already have a chest putter and like how it feels but you can't travel with it, if it uses a straight shaft, we can make a telescopic shaft for it. If you send us the head, the cost of making the telescopic shaft is the same as the normal cost of the chest putters because it will require a little more shop time since we can't use our standard cutting jigs. As described on our "Custom Club" page, if you want us to remove your head, there is a $15 cost assuming it is an epoxy-fitted shaft as are most clubs. If your head is a PING which uses a frozen ball-bearing to secure it to the head, there are additional charges and implications. Please ask us about that before you submit your order. If requested , we will sell the shaft and collapsing cap for you to install on your head, but it is not less expensive than a complete club. Please inquire here about self-install shaft options. Telescopoic shafts must be straight. But many modern putters have curved shafts to create offset alignment. We have an option for those that is not telescopic, but is a two-piece shaft with a threaded coupling. Click here to read more about that option. +$15 for a custom head cover ($20 if ordered separately). A head cover not only protects the putter head, but more importantly, it prevents damage to your driver and fairway heads while pulling and replacing them in the bag. Since the chest putter will be the longest club in your bag, it is prone to clang into the other clubs and cause damage without a padded head cover. We install deluxe Tackimac 2-Piece Grips on our chest putters. Tackimac grips have a great feel. They "tack up" when washed. Note that the two sections are separated more than in this picture. We place the middle of the lower grip is 19 inches from the end unless you specify a different location in the Comment Box during checkout. As with all our clubs, we guarantee your satisfaction or your money back. FOR LIFE! Our telescopic shafts will NEVER wear out or become loose. Many of our customers come to this website when they have a trip planned. So they want their putter ASAP. We build telescopic long putters AFTER we receive the orders because of the length options. It usually takes 1 business day to process and schedule the order, another day to build the club and let the epoxy cure, and we ship the second or third business day. If you need a club faster than that, please contact us before you place your order so we can discuss the options. If our shop-schedule permits we can sometimes ship the next business day. MSRP $299 with a telescopic shaft and black grip. As part of a special April promotion, if you place your putter order by the end of April , we will take $50 off your order! That drops the price from $299 down to $249! You can use our secure online order form or call us directly. Chest putters are available in standard length options from 46 inches to 51 inches (117cm to 129.5cm) which are the most popular lengths. *There is an additional $20 cost for chest putter lengths from 51 to 54 inches, and $40 for 55 and 56 inches (139.7 and 142 cms) if you are the center for an NBA team! The 55 and 56 inch options require a separate shaft section, and a thin joint is visible between the 2-piece grips. This is a minor cosmetic issue, barely noticeable even if you are looking for it. All measurements include the head. So the final club length is measured from the floor in the address position, to the end of the grip. When collapsed, a telescopic 50 inch chest putter is about 36 inches long (91.4 cm) which easily fits into a travel golf bag when collapsed. Even the longest 56 inch option collapses to 41 inches which still fits in any travel golf bag. See the Two-Piece Threaded Coupling Shaft Option below. 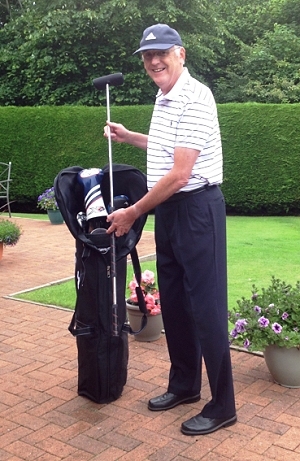 If you want to be able to put your chest putter into a roller bag along with your other telescopic clubs, the standard telescopic option won't work because it only collapses down to about 36 inches (91.4 cm). We can machine a custom threaded coupling so, when separated (unscrewed) it is 1/2 inch longer than half the full length. For instance, a 50-inch chest putter can be separated into two sections that are 25.5 inches (64.77 cm). Click here to read more about that option. What is the ideal length for your chest putter? How do you measure for a chest putter? The following section provides more details about how you can determine the ideal length. As you can see from the pictures below, there are quite a few different ways to hold a chest putter. It becomes a matter of comfort and preference. Adam Scott, one of the top players in the PGA has a very high top hand position and leans over quite a bit. Others have a more upright stance and their top hand is in the middle of their chest. Your preference of top-hand position will be related to the length of the club. The longer the club, the higher the top hand position. Having said that, the key element is that the top hand is anchored against the chest, so the hand position and related length is not as critical as you might think. At the very least, a couple inches up or down doesn't seem to make that much difference for most players. In large part, comfort depends on how you get started. If you don't already have experience and comfort with a given length and upper hand position, I suggest a position where your forearm is somewhat parallel to the ground. It is more relaxed with less tension which is beneficial to a good putting stroke. See the length section below for more about how to decide on your preferred length. The lower hand grip is completely one of personal preference. I like the grip shown in the first picture. It is more relaxed for me. But I have friends who putt using the other two methods which work great for them. Once you get your putter, you can experiment with each of the grip styles to find your most comfortable. Length: How do you measure for a chest putter? Most chest putters are 46" to 52" (116.8 cm to 132 cm) . Chest putter lengths can vary quite a bit, and still be comfortable. Simply stated, a longer or shorter shaft will change the position of your top hand and forearm. But the top of the shaft will still be held against your body. In reality, an inch or two either way will work fine. So there is no need to worry too much about finding an "ideal" chest putter length. If you think you will be more comfortable with a higher or lower hand position, you can measure the desired length the same way, to the top of your left hand in the position that you desire while in a putting stance. If you want to experiment a little, you can tie or tape a broom handle or other similar pole to your conventional putter so that the end of the pole is at the desired length. A bungee cord tightly spiraled around the shaft and pole works great. This will allow you to experiment with your stance and hand position to determine a comfortable length by adjusting the stick up or down. Keep in mind that the head of your conventional putter is significantly lighter than the actual chest putter. So when you get your actual chest putter, you will notice that the heavier head has a fantastic feel. Also, the lie angle of a conventional putter is flatter than a chest putter, so while you are practicing with this extended stick method, you will notice that the toe is down and the heel is up. Of course, your chest putter head will be flat to the ground.